Pitch Your Peers, Inc. of Greenwich (PYP) announced Steviann Martines as its first ever Grant Champion and Community Centers Inc. (CCI), of Greenwich as its first ever Grant Recipient. Martines will award CCI with a check for $30,000 from PYP at the inaugural grant reception to take place on Wednesday, November 30, at 7:30 p.m. at the Innis Arden Golf Club in Old Greenwich. “I put a lot of hard work into the pitch, and it paid off. To have my $1k turn into $30k and for CCI to be the recipient is extremely rewarding” explained Martines. PYP is the newest grant-funding 501c3 organization in Greenwich with a membership of 37 Greenwich women. Collectively the organization will fund grants to non-profits that serve the local community. Currently the PYP membership is invitation only and focused on developing a select group of women comprised of an essential mix of working and stay at home mothers. The main thread that bonds members is local philanthropy and a few degrees of separation from founding members; Brooke Bohnsack, Dara Johnson, Nina Lindia and Rachael LeMasters. Unlike other grant-funding organizations, PYP has no Request for Proposal (RFP) process. Rather, it is the members who come forward as “Grant Champions” and represent the charity they are passionate about by pitching to the membership. Grant Champions will research a charity and create a sales pitch to be delivered at the annual Pitch Meeting, which took place this year on October 6th at the Greenwich Library. The membership then votes, and the winning Grant Champion is awarded a grant to the non-profit she successfully pitched. 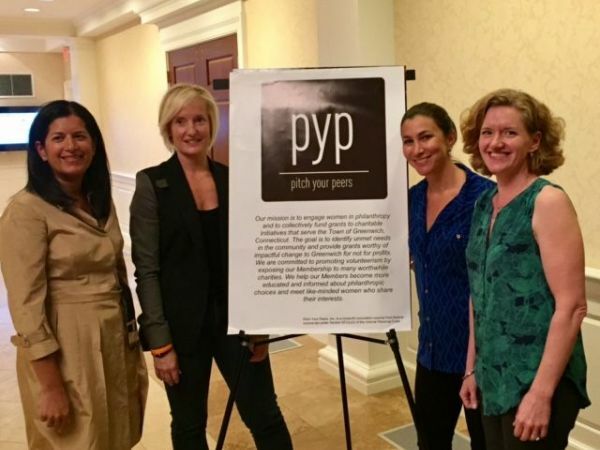 “The PYP process highlights the membership’s existing skill set of sales, marketing and public-speaking, all while educating the membership about deserving charities right here in Greenwich” said Bohnsack. This year’s PYP Grant Champions were: Karena Bailey and Julie Karish for B*Cured, Monica Huang for Byram Park Pool Project, Steviann Martines for Community Centers Inc. of Greenwich and Karina Solomon and Lisa Getson for Kids in Crisis. After the first Pitch Meeting members have an opportunity to follow up with each Grant Champion and her chosen charity to ask questions, and visit the sites and working projects of the agencies where possible. “What is special about this process is that our membership became educated about all four projects in a unique, hands-on way. In turn, each charity was given the opportunity to recruit new volunteers and potential funds to their respective causes”, Bohnsack added. She continued, “The PYP membership voted through an anonymous online survey and we were faced with a tie between Kids in Crisis and CCI”. On November 3rd PYP held a second round of voting with CCI emerging at the winner by just one vote. “Community Centers, Inc. of Greenwich is extremely grateful to be this year’s recipient of the PYP grant. This grant will enhance our ability to raise funds for our programs, create more awareness of our organization, and ultimately increase our impact with respect to counseling, education, recreation and advocacy activities for Greenwich residents in need” said Community Centers, Inc. Executive Director, Lauren Franciamore, LCSW. Students from the Advanced Broadcast Journalism class at Sacred Heart Greenwich have been filming the PYP process, interviewing founders and Grant Champions, and created a short video package about PYP. “We were thrilled to have these aspiring film-makers, under the direction of their visionary teacher, Ellyn Stewart, participate in our Pitch Meeting and we are all looking forward to having them at our first grant award ceremony” said Lindia.